Though, American roulette is a regular version of original roulette but it has its some unique rules. American roulette has 38 different slots and it contains slots with the number 1 to 36 and two different zero slots. One is the 0 slot another is the 00 slot. The main difference between American European roulette is the 00 slot. People can bet on each number or they can bet on the combination of the numbers. When all bets are placed then the dealer starts the spinning of the wheel then put the ball in the wheel. Every table displays the bets of that round and except the Atlantic City all casinos of United States. The house edge for all type bets is 5.26% or 1/19 but for the combination 0-00-1-2-3 the house edge is 7.89% which is higher than regular. Though, the American roulette has 2 zero slots but you can find many popular and expensive casinos in United States where roulette with single 0 slot is available. Most of the high class casinos all over America has the 1 zero slot roulette with the traditional 2 zero slots American roulette. Limits for single zero slot roulette is normally higher than regular 2 zero slots American roulette. There are also some casinos with 1 zero slot roulette where the minimum betting amount $.25 only and for single zero slot roulette the house is 2.70% or 1/37. Atlantic City has its own rules for their single and double zero slots roulette. They mixed the rules of American and European roulette to make their own rules. 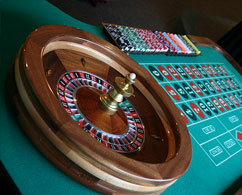 They usually follow the European single zero slot roulette wheel rules for the American roulette. By this rule, if the ball put on the zero slots of American roulette then players will lose only the half of their real betting amount not whole and this decreases the regular house edge to the 2.63%. This exceptional rule can only apply on the American 2 zero slots roulette but not on the single zero slot roulette. In the European roulette wheel, there is only one zero slot and the rules are slightly different from American roulette. "En prison" is the most significant rule of European roulette. The rule states that if the player bets on the numbers or colors and the ball gets on the zero slot then the player will get back half of his or her original betting amount. Without having the half back, player can bet on the next round with the money and if he or she win then he or she will get their full betting money back but not the winning and if he or she loses then he or she will only lose the rest half of the last round only.